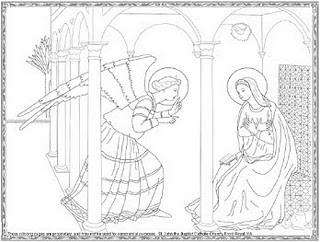 A Slice of Smith Life: The Feast of the Annunciation Coloring Page! Today is the Feast of the Annunciation when the Angel Gabriel announced to Mary that she has been called to carry and give birth to God's son and name him Jesus. (Luke 1: 26-38) Nine months from today, we will be celebrating the birth of our Saviour! I just found the above coloring page from a link at Catholic Icing and then from that link I found lots of Catholic Coloring Pages ! This morning I went to Mass with my children where our bishop concelebrated the Mass with a local priest. It was beautiful and such a special way to remember that Mary's trust and courage to say "yes" to God's will changed the whole world! I am now in the process of making homemade pretzels (the dough is rising). I got the recipe off of Holy Heroes Lenten Adventure for today. Happy Feast Day! Please join Lynda, Anna-Marie and myself for March's No Ordinary Blog Hop (NOBH). You can link up any or all your posts for the entire month of March. The blogger with the most posts will be awarded a Star Blogger Award and each post will be an entry to a great giveaway! Click below for details! Thanks, I did not know about this Feast! Hi Tracy, your you tube post is incredibly moving. I hadn't heard it before, thank you for sharing it! I'm so excited to meet you "blog hop" ladies! And I LOVE this post! Isn't Mary AMAZING? !!! I absolutely love and adore her! Thanks so much for sharing this. So glad you stopped in and left your comment! Glad this post gave you some insight on another feast day of our beautiful Catholic faith! Hope you are having a blessed weekend! I'm glad you enjoyed this Sting video with your family! It is beautiful! I'm glad you enjoy reading my posts about the beautiful Catholic Church! Yes, it is Saturday today! You got it right..Yeah! :) Have a blessed weekend! Great video! I printed out this coloring page as well. The kids love it! We have been doing Holy Heros Lenten Adventures, and love it. I can't wait to see how your pretzels turned out. Have a wonderful rest of your weekend. Happy Feast Day (a day late Ha Ha on my end)! I'll have to share my pretzel pic soon!